Satan is bound for a thousand years. (1-3) The first resurrection; those are blessed that have part therein. (4-6) Satan loosed, Gog and Magog. (7-10) The last and general resurrection. (11-15)1-3 Here is a vision, showing by a figure the restraints laid on Satan himself. Christ, with Almighty power, will keep the devil from deceiving mankind as he has hitherto done. He never wants power and instruments to break the power of Satan. Christ shuts by his power, and seals by his authority. The church shall have a time of peace and prosperity, but all her trials are not yet over. 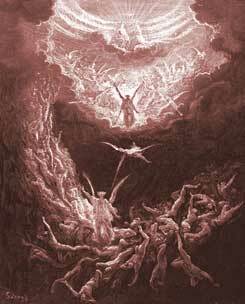 4-6 Here is an account of the reign of the saints, for the same space of time as Satan is bound. Those who suffer with Christ, shall reign with him in his spiritual and heavenly kingdom, in conformity to him in his wisdom, righteousness, and holiness: this is called the first resurrection, with which none but those who serve Christ, and suffer for him, shall be favoured. The happiness of these servants of God is declared. None can be blessed but those that are holy; and all that are holy shall be blessed. We know something thing of what the first death is, and it is very awful; but we know not what this second death is. It must be much more dreadful; it is the death of the soul, eternal separation from God. May we never know what it is: those who have been made partakers of a spiritual resurrection, are saved from the power of the second death. We may expect that a thousand years will follow the destruction of the antichristian, idolatrous, persecuting powers, during which pure Christianity, in doctrine, worship, and holiness, will be made known over all the earth. By the all-powerful working of the Holy Spirit, fallen man will be new-created; and faith and holiness will as certainly prevail, as unbelief and unholiness now do. We may easily perceive what a variety of dreadful pains, diseases, and other calamities would cease, if all men were true and consistent Christians. All the evils of public and private contests would be ended, and happiness of every kind largely increased. Every man would try to lighten suffering, instead of adding to the sorrows around him. It is our duty to pray for the promised glorious days, and to do every thing in our public and private stations which can prepare for them. 7-10 While this world lasts, Satan's power in it will not be wholly destroyed, though it may be limited and lessened. No sooner is Satan let loose, than he again begins deceiving the nations, and stirring them up to make war with the saints and servants of God. It would be well if the servants and ministers of Christ were as active and persevering in doing good, as his enemies in doing mischief. God will fight this last and decisive battle for his people, that the victory may be complete, and the glory be to himself. 11-15 After the events just foretold, the end will speedily come; and there is no mention of any thing else, before the appearing of Christ to judge the world. This will be the great day: the Judge, the Lord Jesus Christ, will then put on majesty and terror. The persons to be judged are the dead, small and great; young and old, low and high, poor and rich. None are so mean, but they have some talents to account for; and none so great, as to avoid having to account for them. Not only those alive at the coming of Christ, but all the dead. There is a book of remembrance both for good and bad: and the book of the sinner's conscience, though formerly secret, will then be opened. Every man will recollect all his past actions, though he had long forgotten many of them. Another book shall be opened, the book of the Scriptures, the rule of life; it represents the Lord's knowledge of his people, and his declaring their repentance, faith, and good works; showing the blessings of the new covenant. By their works men shall be justified or condemned; he will try their principles by their practices. Those justified and acquitted by the gospel, shall be justified and acquitted by the Judge, and shall enter into eternal life, having nothing more to fear from death, or hell, or wicked men; for these are all destroyed together. This is the second death; it is the final separation of sinners from God. Let it be our great concern to see whether our Bibles justify or condemn us now; for Christ will judge the secrets of all men according to the gospel. Who shall dwell with devouring flames? Verses 7,8~The final test will be after Christ's 1000 year reign. All mankind will be brought back to perfection and face a test from the Devil in a perfect human state. There are those whose names will be found written in the Book of Life! It does not say, that everyone who is judged will be thrown into the lake of fire; but those whose names aren't written in the Book of Life! In another part it also talks about the Nations of the saved, whom the Saints will rule over. Jesus came to save men's lives not destroy them! How many like Lazarus the beggar are waiting! Notice that there r more than one books mentioned. One of them being the book of life. Anyone not written in this book of life was cast into the lake of fire.That means all these pple being judged by their works will perish. Its not about our good works. Our good works cannot get us in the book of life. There is clearly a way we think (our good works) n a way God has prepared; JESUS. Rev 20:12 refers to "book of life". This is also found in vs 15 "not found written in the 'book of life' was cast into the lake of fire". Rev 3:5 "I will not blot out his name out of the 'book of life' ". We KNOW because of God's LOVE that it is His Will that every human being, including the aborted ones, throughout eternity was destined for Heaven. CONTINUED . . . The same God that told of Heaven also told of HELl and listen to Jesus preached on HELL more than heaven ! The problem today is people need to understand all scripture unites under the one God ! He made it all ! The place Hell is resl Jesus Christ told of rich young ruler who lifted his eyes in HELL !!!! 4 And I saw thrones, and they sat upon them, and judgment was given unto them: and I saw the souls of them that were BEHEADED for the witness of Jesus, and for the word of God, and which HAD NOT worshiped the beast, neither his image, neither had received his mark upon their foreheads, or in their hands; and THEY lived and reigned with Christ a thousand years. ...WOW! Simple Fi / Always Faithful! What Do You Think of Revelation 20? What blessing is bestowed on those who are raised in the first resurrection?